If you're already in the habit of cooking Moroccan food, you probably know that it's easy to build on a number of basic recipes to add vegetables, beans or other ingredients or to adjust and experiment with seasoning, such as adding a little smen or perhaps some Ras El Hanout. 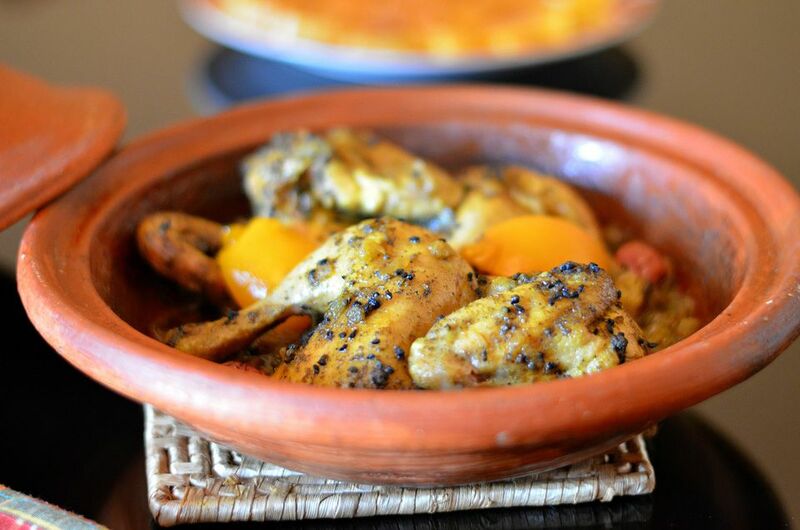 The cooking time is for preparation in a traditional clay or ceramic tagine. The time will be reduced by one hour if cooking in a conventional pot. The meal is traditionally served directly from the tagine or on a communal plate, with each person eating from his own side of the dish. Serve Moroccan bread for scooping up the chicken and sauce. Pour the olive oil into the base of a tagine or the bottom of a wide pot or Dutch oven. Distribute the sliced onion over the bottom. In a bowl, toss the chicken with the chopped onion, garlic, ground nigella, whole nigella and spices. Arrange the chicken bone side down in the center of the tagine or pot, and distribute the chopped onions all around. Swirl 1/3 cup of water in the bowl to clean it of the spices, then add the water to the tagine or pot. If using smen, add it to the liquids. Garnish the tagine with the cilantro bouquet, lemon and olives. Follow one of the cooking methods below. If cooking in a tagine, cover and place the tagine on a over medium-low heat. Use a diffuser if using a heat source other than gas. Allow the tagine to heat slowly to a simmer, and then reduce the heat to the lowest temperature necessary to maintain the simmer. Cook the chicken for one and a half to two hours or until very tender, interrupting the cooking only to check on on liquids. The chicken should be tender enough to pinch off the bones and the sauce should be reduced until thick and not watery. Discard the cilantro, and serve directly from the tagine. If cooking in a pot or Dutch oven, cover and bring the chicken to a simmer over medium-high heat. Reduce the heat to medium or medium-low, and continue cooking, stirring occasionally and turning the chicken once or twice, for another hour, or until the chicken is tender enough to pick easily from the bones. Keep an eye on the level of the liquids during cooking to avoid scorching the chicken, adding a little more if necessary. Once the chicken is cooked, be sure to reduce the liquids (if necessary) to a thick sauce, discard the cilantro, and serve.